Union Cabinet chaired by Prime Minister Narendra Modi has approved a new umbrella scheme ‘Pradhan Mantri Annadata Aay SanraksHan Abhiyan’ (PM-AASHA) on 12th September 2018. The scheme aims to ensure that farmers get remunerative prices for their produce as announced in the Union Budget for 2018. Addressing the media in Delhi, Agriculture Minister Radha Mohan Singh said the Cabinet also decided to give an additional government guarantee of Rs 16,550 crore for procurement, taking the total to Rs 45,550 crore. The new umbrella scheme includes the mechanism of ensuring remunerative prices to the farmers and is comprised of - Price Support Scheme (PSS), Price Deficiency Payment Scheme (PDPS) and Pilot of Private Procurement & Stockist Scheme (PPPS). In PSS, physical procurement of pulses, oil seeds and Copra will be done by Central Nodal Agencies with proactive role of State governments. It is also decided that in addition to NAFED, Food Cooperation of India (FCI) will take up PSS operations in states /districts. While under PDPS, it is proposed to cover all oil seeds for which MSP is notified. In this direct payment of the difference between the MSP and the selling/modal price will be made to pre-registered farmers selling his produce in the notified market yard through a transparent auction process. All payment will be done directly into registered bank account of the farmer. 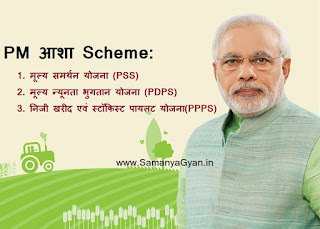 As for PPSS, the selected private agency shall procure the commodity at MSP in the notified markets during the notified period from the registered farmers in consonance with the PPSS Guidelines. Whenever the prices in the market fall below the notified MSP and whenever authorized by the state/UT government to enter the market and maximum service charges up to 15% of the notified MSP will be payable.